Eligibility for in-state tuition increases access to college for undocumented students. Undocumented students who obtain college degrees cannot work legally in the U.S. and are ill-equipped for the transition into illegality (1). Support from teachers and other school staff is an important factor in increasing educational achievement and college attendance of undocumented students (1,2). In 1982, the U.S. Supreme Court ruled in Plyer v. Doe that undocumented children have a right to K-12 public education (3). However, there is no such guarantee for higher education, thus these students are not eligible for federal financial aid. 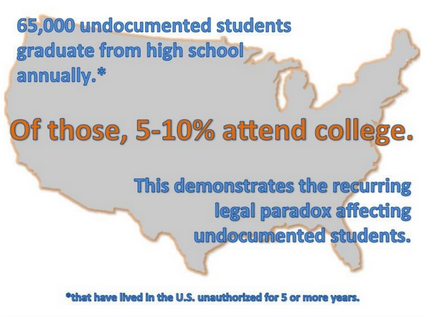 Each year, 65,000 undocumented students graduate from high school, but only 5-10% continue to college (4). These students occupy a position between belonging and exclusion, which negatively impacts their educational motivation, success and aspirations (5; 6). Even when students have opportunities to attend college, cost deters many students because they don’t qualify for in-state tuition or financial aid. Twenty states have granted in-state tuition, but many high schools in those states are not well equipped to help undocumented students navigate access to higher education (7; 2). Although some undocumented students have found ways to continue their education beyond K-12, these students still have no path to legal residency and work after they graduate from college (8). Research on access to higher education for undocumented students usually focuses either on policy implications or on student social capital, support networks and resiliency. This work utilizes court case analysis, qualitative investigation of student experiences, and statistical reporting (5). Frameworks such as social capital theory, cost-benefit analysis, and legal theory shape the conclusions of these studies (6; 2). Most of the research is focused on the politics and effects of in-state tuition eligibility, as very little research is available yet on the effects of DACA on undocumented students (11; 9). There is consensus among scholars that the federal DREAM Act which provides a pathway to citizenship is necessary not only for the immigrants that it directly affects, but for a U.S. society that is increasingly in need of college-educated workers (4). The Deferred Action for Childhood Arrivals (DACA) program may address some of this need by allowing legal work for these young immigrants, but it does not provide a path to legal residency and its existence is dependent on the continued support of the administration (9). While there is scholarly consensus on access to higher education for undocumented students, there is little political consensus and heated debate over the rights of undocumented immigrants is common. Legislation such as the DREAM Act places undocumented students on the path to legal residence, which not only expanding access to higher education, but also opening up opportunities for these students to legally live and participate in the U.S. (4). Additionally, expanded eligibility for in-state tuition makes higher education more accessible. It is also important that high schools are knowledgeable and well equipped to help undocumented students navigate DACA and in-state tuition eligibility. Teachers and administrators must also support these students and their needs, as positive relationships with teachers and school counselors are key factors for undocumented students who reach and graduate from college (1; 2). The policies surrounding college education for undocumented students are highly politicized and differ vastly from state to state (10). When schools are not adequately informed about the complexities of these policies, undocumented students must turn to informal support networks of other students to navigate the path to college (2). Policies to expand in-state tuition access do not increase long term economic mobility for undocumented students unless they are coupled with access to legal work opportunities (8).